Look what the cat dragged in...Designers finally caught on that cats really are little people in fur coats and deserve posh living quarters, too. Although, I'm quite sure the driving motivation was making money on people with good taste. Gone are the days when your only options are towering carpet poles and plaid cat beds. Check out this Cat Cocoon from Plush Pod. 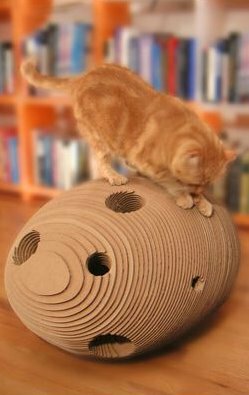 Taking 83 laser-cut double wall corrugated cardboard shapes, it's then sculpted into a heavy and durable pod that stays put. 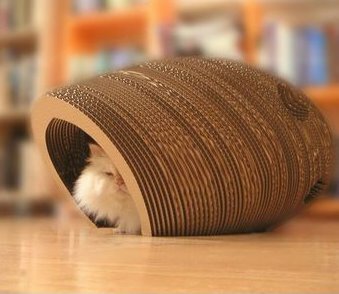 Kitty can scratch it, hide inside, and sleep in stylish quarters that will blend in nicely with the design of your room. It's a bit expensive at $279, but shipping is free and Plush Pod promises delivery within 1-2 weeks. Let the cat out of the bag...opt for a cocoon instead.